I use paste papers as inside cover pages for some books. 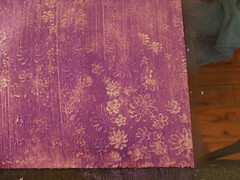 This is a tutorial for how I make paste paper. Air Tight Container - I use the Rubbermaid TakeAlongs Sandwich containers. Wheat paste can be made from wheat starch or unbleached flour. Wheat starch is not available in my area so I use unbleached flour. I use 1 part flour to 5 parts water. Wisk water and flour together to get rid of most of the lumps. Heat over Medium heat stiring constantly. Patience is key because if the heat is too high the flour will burn and stick to the bottom of the pan. When the flour thickens and turns sort of translucent it is ready. The paste will thicken more as it cools. Pour into an air tight container. Keep in the fridge or a cool place. Pour water over the top of the paste so that it covers the entire surface. This will help in keeping the paste air tight and reduce the production of mold. I toss any left over paste after a week. 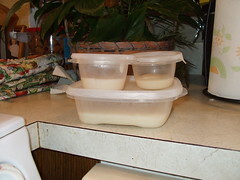 Small Containers - I use the Rubbermaid TakeAlongs Small Round containers. 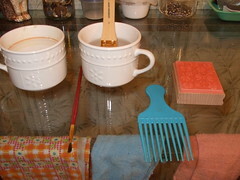 Pattern tools - For this tutorial I used a hair pick, paint brush, rubber stamp, and a mug. After the paste has cooled, spoon a few scoops of paste into a small container and mix with a drop or two of paint. 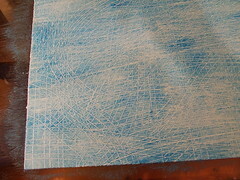 Watercolor or acrylic paints can be used to tint the paste. Watercolor mixed with the paste is very light and translucent while the acrylic is bolder and gives more coverage. Use a damp cloth to dampen the paper. 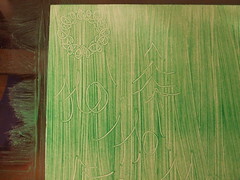 Don't make the paper too wet so that the water pools on the surface and don't rub the paper to much. Using a large brush and working from the center out, brush the paste paint onto the paper using large brush strokes that extend over the edges of the paper. If the paste is too thick to spread evenly, dip the brush in water and brush through the thicker parts to thin them out. 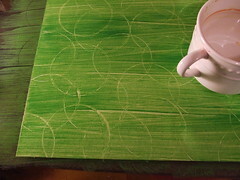 After creating patterns, lay on a flat surface to dry. I used a few different tools to create patterns on my paste papers. I used a hair pick, the end of a paint brush to draw, a rubberstamp, and the bottom of a mug to create circles. Below are a few photos of how these turned out. 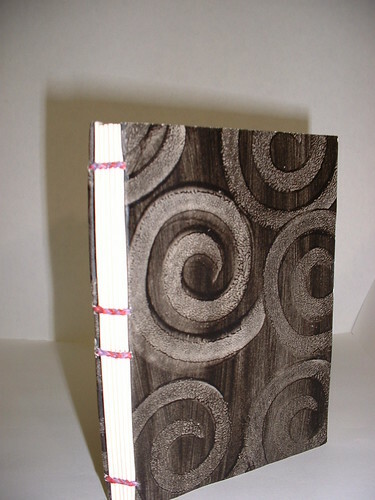 Here are a few photos of books that I've made that used paste paper. Swirl Foam Stamp Paste Paper covers. 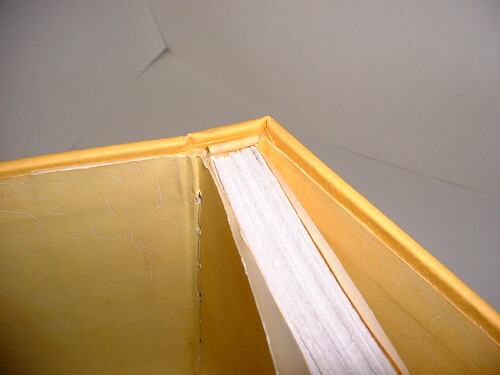 Sunshine Paste Paper inside a case bound book. Okay! I made a batch of paste - it's cooling right now. I'm not sure I have the consistency right. It's fairly thick, about the consistency of cake batter. I don't think I could pour water over the top if it without the two mixing though. I was pretty worried about burning it. It never got really translucent, but it did develop a high sheen. I'm wondering if you wouldn't mind describing the consistency of the paste when you remove it from the heat? if you're concerned about burning the paste, it helps to use a double-boiler rather than having a pan directly on the burner.